Hurtling across the mountains of Spain on high-speed rail, the last rays of a winter sun were bouncing off the rolling green landscape. In under an hour I would be transported from the teeming tapas bars of Madrid to the laid-back, medieval vibes of Cuenca. 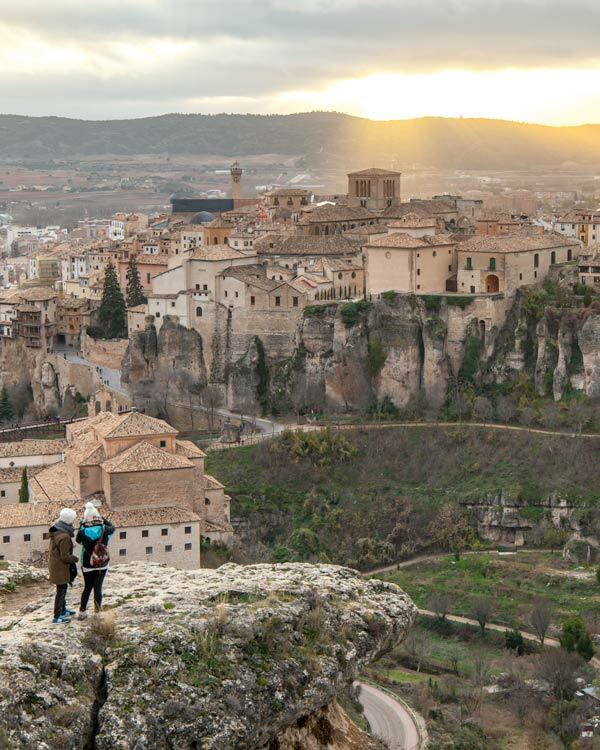 While many would make this journey as a day trip from Madrid, I was excited to spend a weekend in Cuenca soaking up every little corner of its Spanish soul. 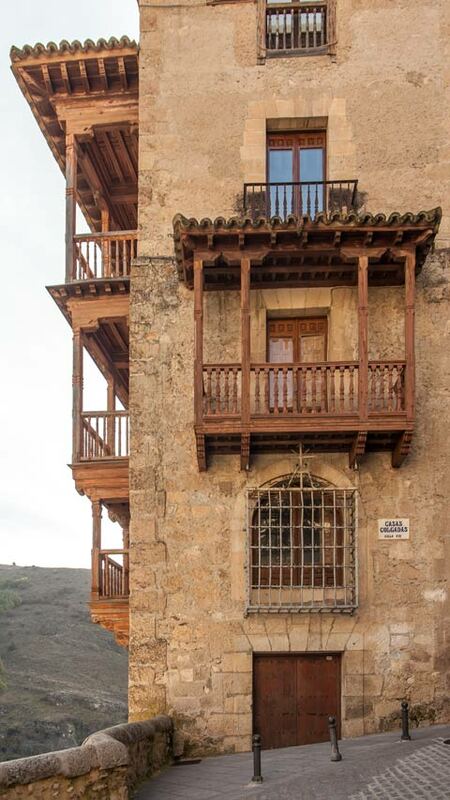 Famed for the Casas Colgadas which translate to hanging house, the old city of Cuenca is well deserving of its UNESCO world heritage status. As I strolled across the San Pablo bridge, with the stars and moon illuminating the sky above me, I felt like I was stepping back in time. Two days later, when the moment would come to leave Cuenca, it felt bizarre to return down to the modern world. From the pastel-hued houses on Plaza Mayor to the hours I spent admiring sunset from the castle ruins, Cuenca was the perfect 48-hour escape from reality. 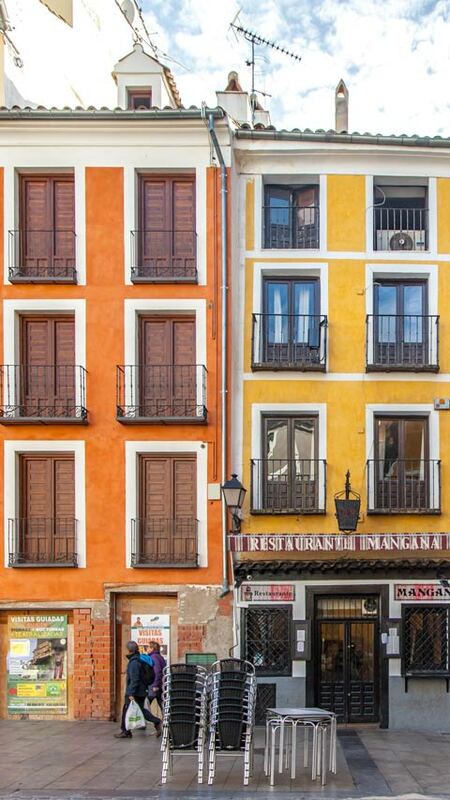 Arriving at Cuenca, Spain, is relatively fast and affordable. 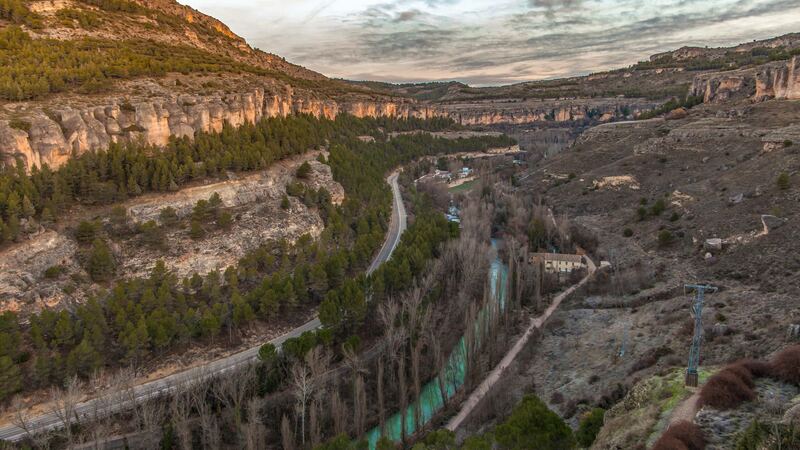 Whether you opt to drive, or use public transport, coming to Cuenca from Madrid can be done in under an hour. You can quickly get to the out of town station of Cuenca AVE (Fernando Zobel) in under an hour by high-speed rail or a slower, and slightly cheaper train service goes directly to the new part of the city which is the station simply named Cuenca. From Fernando Zobel, a new terminal specifically built for high-speed rail, a bus, at the cost of €2.15, will bring you to the heart of the old city in under 30 minutes. A similar timed walk, or 15-minute ride, serve the central Cuenca station to Plaza Mayor. The city of Cuenca is split into two parts, ‘new’ Cuenca, which is where the stations and many stores are, sits underneath the shadow of old Cuenca, both literally and figuratively. 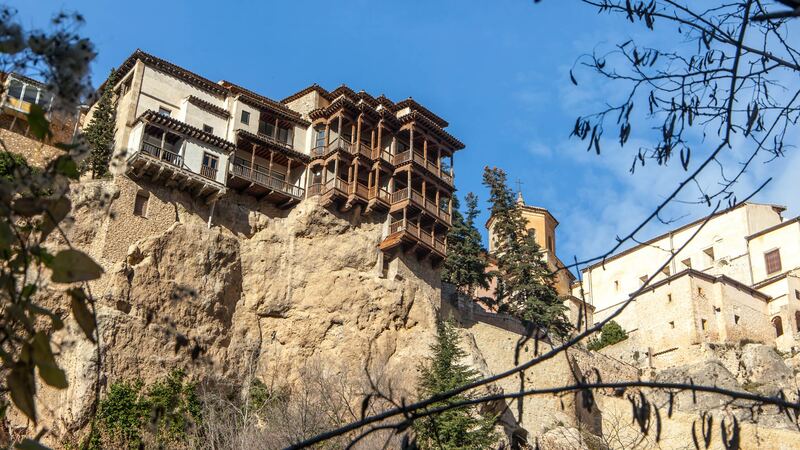 While the new part of Cuenca is nice enough, the main attractions and hidden gem aspect of the city is atop of the rocks which support the hanging houses, and for this 48-hour guide to Cuenca, that will be the focus. 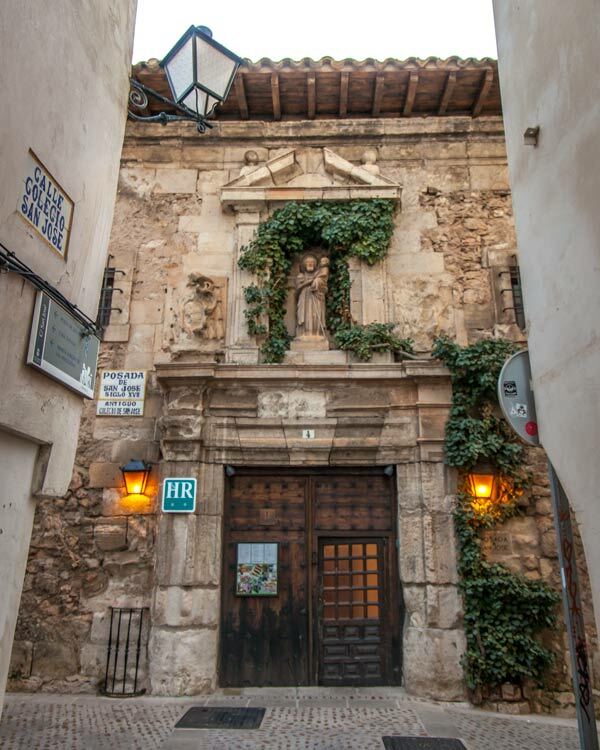 I’ve tried to keep this itinerary relatively relaxed, but if you are a culture vulture, like to stay busy, or plan to explore the local area with a car, check out my full list of things to do in Cuenca and nearby. 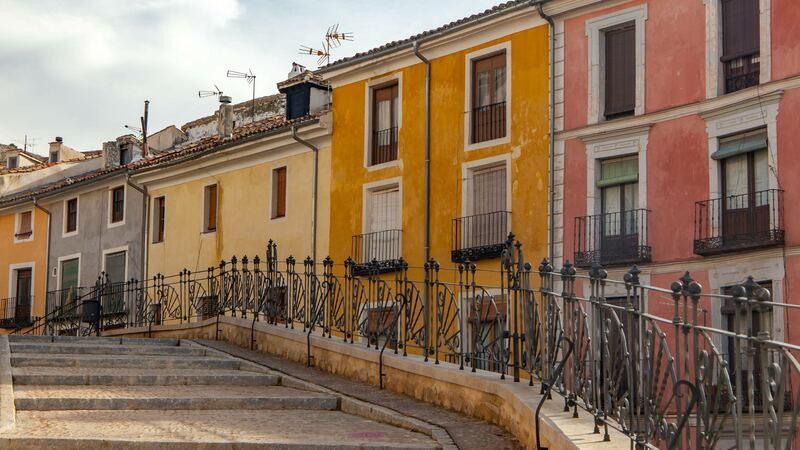 When it comes to booking accommodation in Cuenca, you’ll find a surprising number of options. Be mindful of the old and new parts of the city when securing your accommodation, and I highly recommend you stay in the old city as the sunsets, and after dark atmosphere, are magical. I researched plenty of different choices and eventually settled on Posada San Jose (pictured above), mainly sold by the reviews promising fantastic views, and I certainly wasn’t disappointed. While premium rooms with balconies are a little pricer, I booked a double room with shared bathroom for €30 a night (in December 2018). For the chance to sleep in such a historic building as this, once a convent and then a choirboys school, it seemed a very fair price. The rooms were immaculate, if a little dated, but this all added to the charm. From crooked wooden beams to the slight creeks of the staircase, the maze-like interior was charming. Of course, the main highlight though is the views from the restaurant or balcony, so be sure to take breakfast or dinner here, or both, which I highly recommend. With the sun already set, and my stomach already lined on arrival, I set out to scope the land. 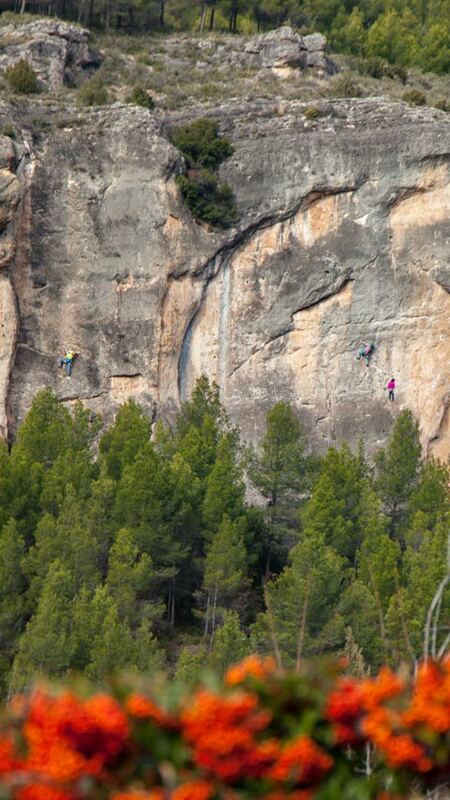 My go to first activity on a weekend escape anywhere, it’s my first suggestion for 48-hours in Cuenca. With the daytrippers gone, and likely fewer tourists in the off-season, this hidden gem in Europe felt magical in the dark. The city is perched on limestone rocks and seems to rise above both the rivers on either side dramatically, the Júcar and Huécar. The hanging houses do indeed seem to dangle over the gorge, but there is only a handful of these left to admire. For the first evening I suggest enjoying the views from across the iron San Pablo bridge, then dipping into one of the bars on Plaza Mayor for a night-cap before an early night, ready for a (hopefully) awesome sunrise. Starting the day right, the light clouds that hung in the air suddenly were illuminated with dramatic shades of pinks and oranges as the sun rose behind the mountain, as yet not in view. At 8 am on a December morning, I felt like I was the king of the castle, as not a single other soul was to be seen. I scurried around the old-town looking for the best viewpoint. For sunrise, I highly recommend taking the short walk from Posada San Jose to near the castle ruins. 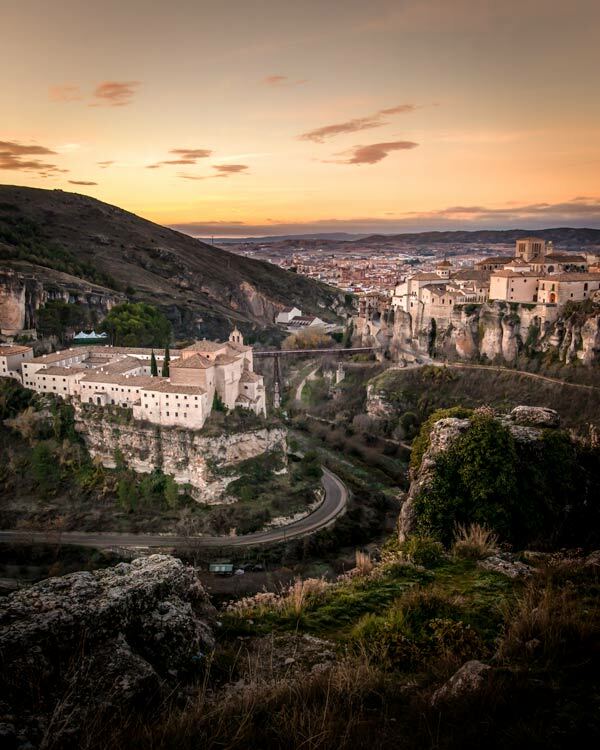 From here you can enjoy a breathtaking sunrise as Cuenca slowly starts to bathe in the golden glow. 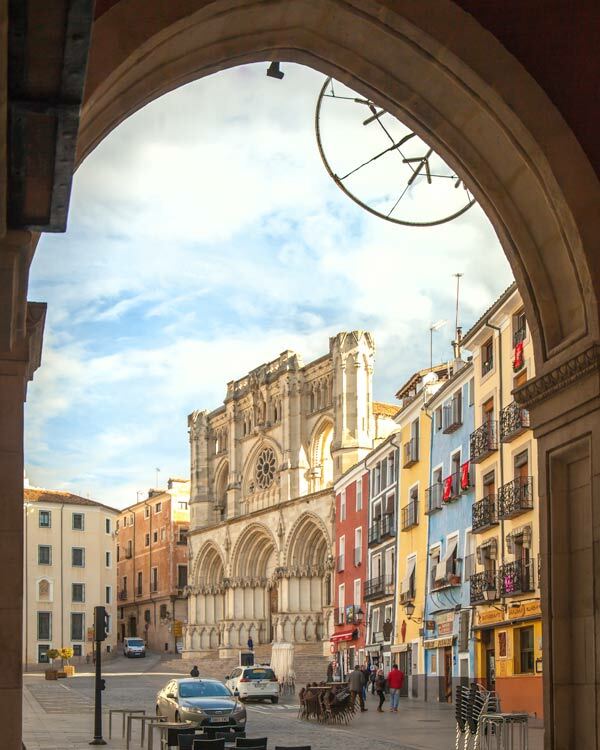 After a café con leche and breakfast at the hotel, where the view is equally as impressive, and a front-facing balcony bedroom might be the very place to enjoy a lazy sunrise, it was time to start putting together this weekend in Cuenca itinerary. While in days gone by, these hanging houses with their wooden balconies would have lined much of the cities cliffs, now just a few remain to one side of the San Pablo bridge. For many, these are the main draw to the city, but I must say while impressive, they wouldn’t be reason enough for me to venture to Cuenca. The city and atmosphere though provides countless other reasons to venture here. Once you’ve got your photos of the Casas Colgados, at 11 am the gallery space inside opens so you can actually venture into these historic houses. 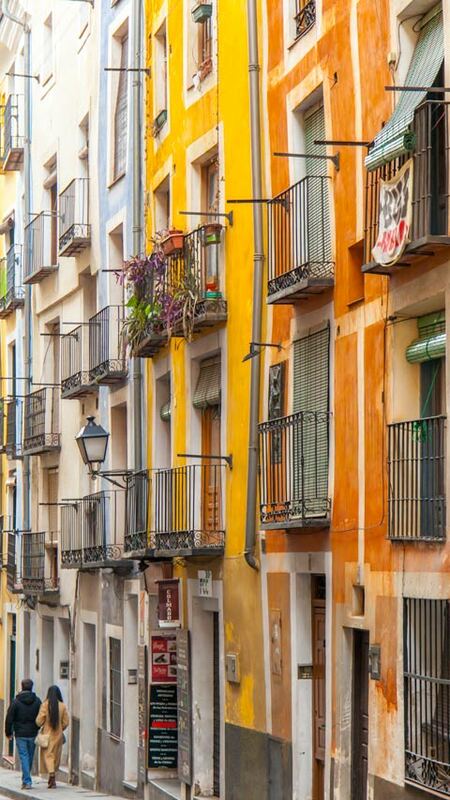 As with much of Spain, many places open later and then close for siestas. As such, I’ve added some rough times to this 48-hour guide to Cuenca, hopefully allowing you to make the most of the day. The city is relatively compact, so doubling back on yourself really isn’t a big deal here. Inside the abstract art gallery is a beautifully appointed space, with apparently a considerable amount of time being dedicated to converting the rooms into a gallery. The perfect balance of white walls and original features compliment the collection of Spanish Abstract Art, and while you can’t get onto the hanging balconies, you can see them from the large glass windows. Another of the iconic features of Cuenca is the iron and wooden bridge of St Pablo which has ferried people across the gorge for over 100-years. 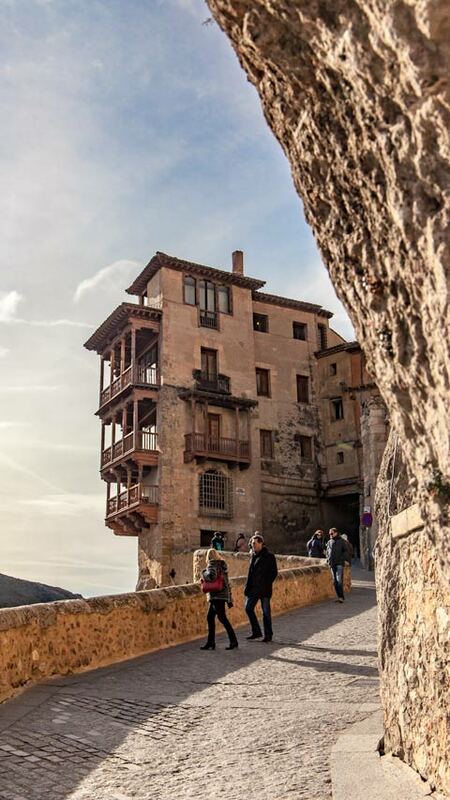 When across, you can really appreciate the magnificent views of the hanging houses and also visit the Parador de Cuenca. 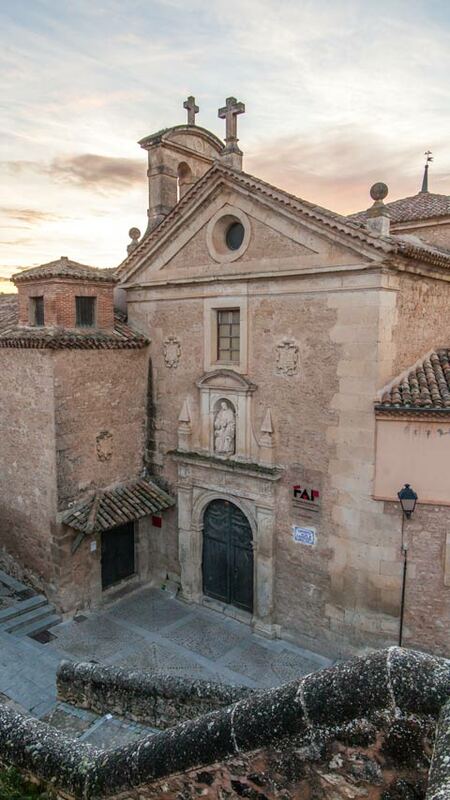 Attached as part of the 16th-century Parador de Cuenca is the St Pablo Church. As with many of the historic buildings across the city, a new breath of life has been given to this restored building. 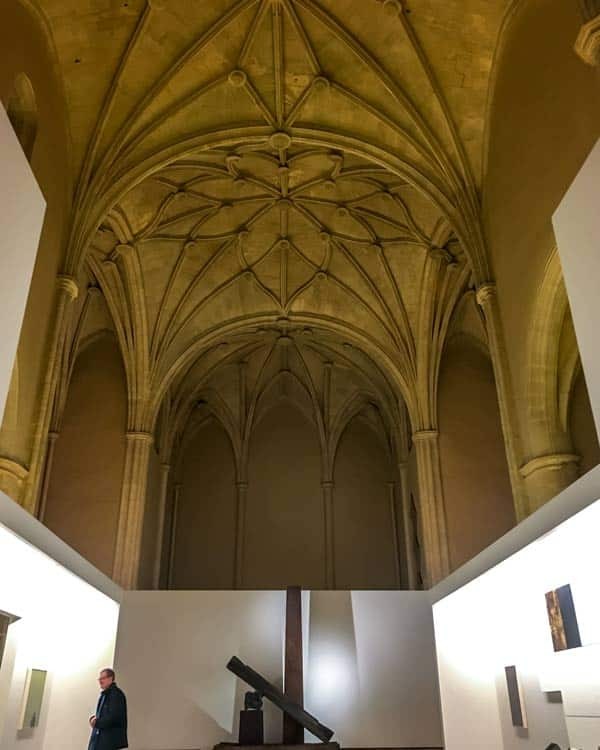 Now a gallery space, it’s worth visiting even if you aren’t interested in the art merely to see the old gothic structure inside. The art space is dedicated to displaying the work of Gustavo Torner, who is an artist from Cuenca. While the collection isn’t huge, the area is well laid out, and the imposing high ceilings amplify the collection. 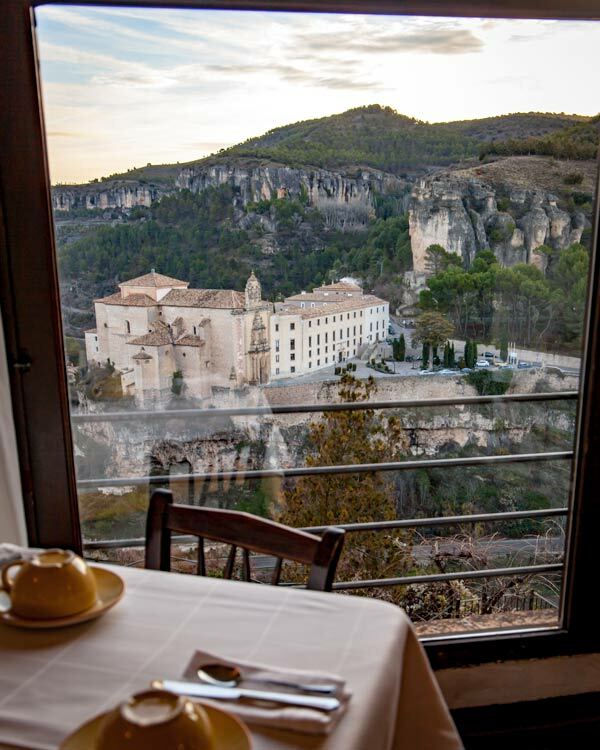 For those who don’t mind a little splurge, you might actually decide to stay in the Parador de Cuenca. The Parador collection which spans across Spain has seen many of these impressive old buildings converted into high-end hotels. For those who aren’t staying though, you can still go inside and admire the impressive repurposing of this 16th-century monastery and the fancy restaurants is the perfect place to enjoy some lunch in redefined luxury. 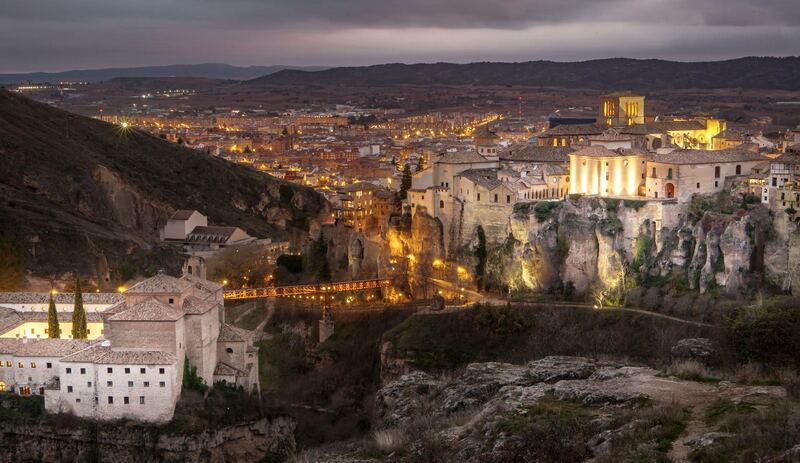 Constructed in the 8th century, the ruins of Cuenca Castle are a reminder of the Moorish history here in the city. Ruins is a very loose word here, as little remains of the old Arabian wall that surrounded the city, nor of the Christian, Fortress which followed. You can find a few turrets, and some parts of the wall, all nearby the well-preserved entrance arch and wall to the city. 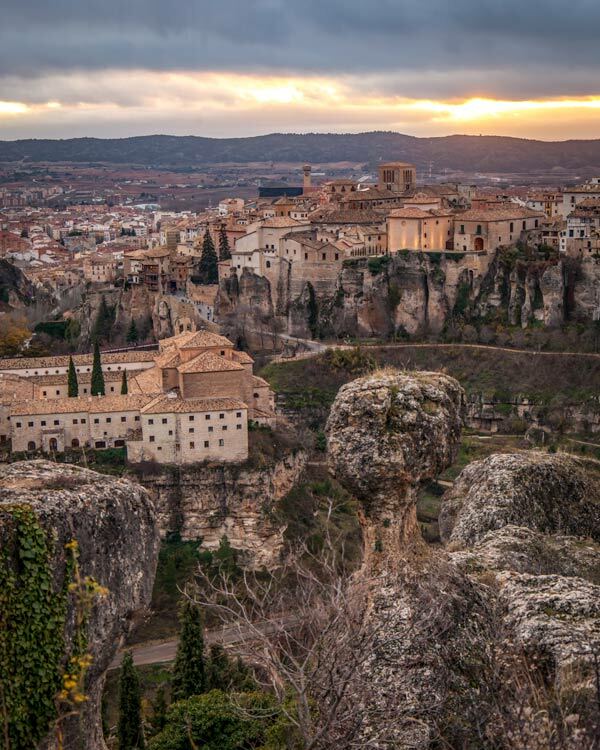 As I was visiting Cuenca during winter, the days were shorter, and it was quickly time for sunset. 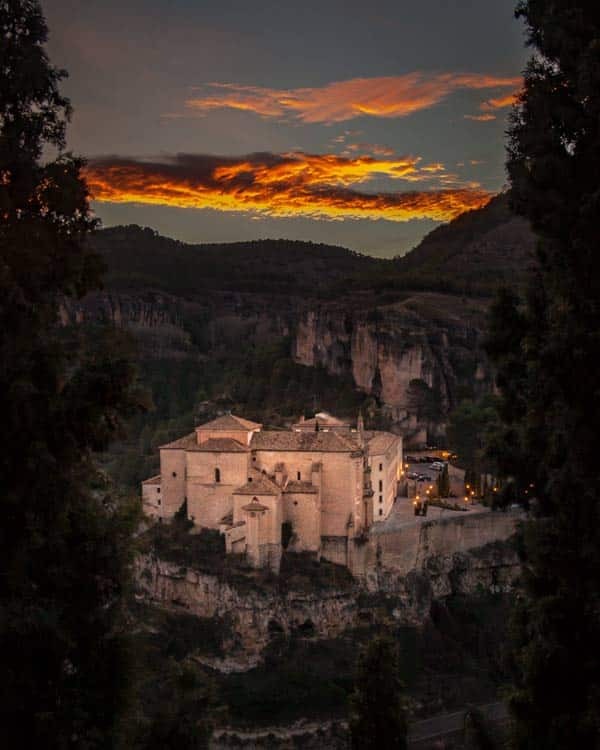 If you are here in the summer months, when the days are longer, there are plenty of other things to do in Cuenca during the daylight hours to fill your 48-hour visit with. For sunset though, I urge you to walk along from the Castle Ruins and skip out on the viewing platforms. Instead, take a prime position on top of the karst mountains in their unique shapes, but please, don’t get too near the edge! 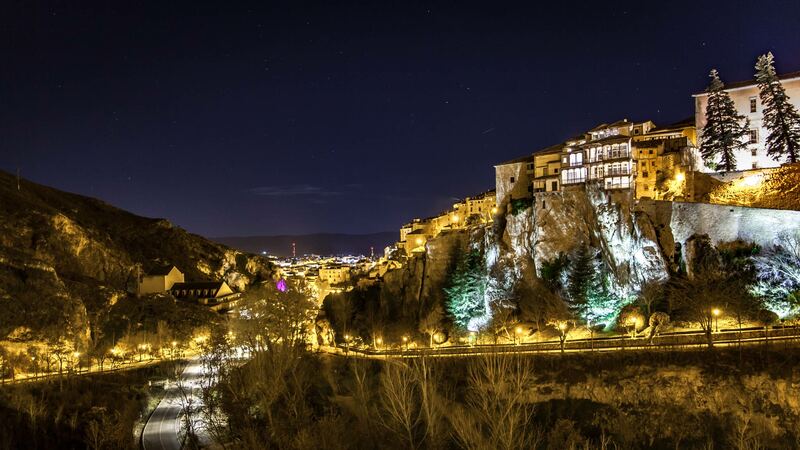 From here you’ll see the sun slowly dip behind the hanging houses and city of Cuenca, and the lights start to illuminate and dance across the historic buildings. As the sky turned from orange, to pink and then to the most incredible shade of purple, I lost all sense of time admiring the views and taking far too many photos of this postcard-perfect hidden gem. With the sun set early, and dinner a late affair in Cuenca, I returned to the colourful buildings of the Plaza Mayor to enjoy a pre-dinner drink. When it comes to dining in Spain, you are always in for a treat, with each region boasting its own speciality dishes. 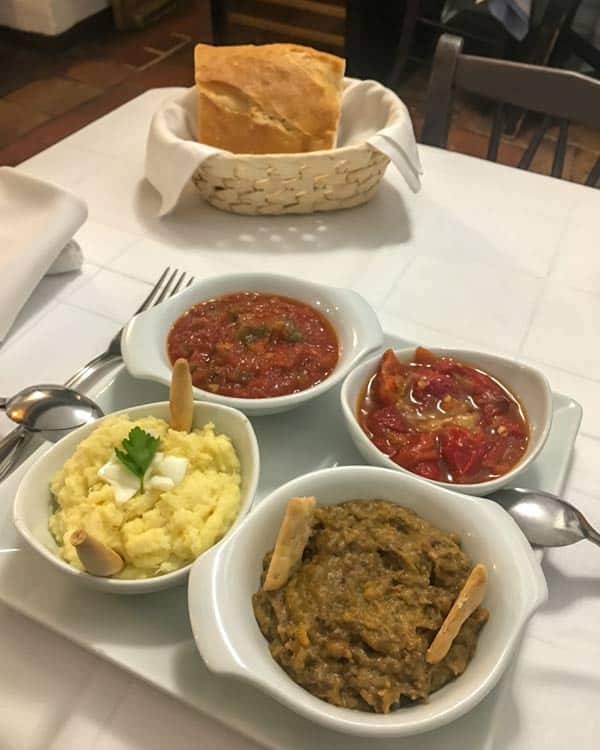 I enjoyed two evening meals during my visit to Cuenca and will list them both here in case either inspire you for dining. The first was at my hotel, Posada San Jose, which also welcomes reservations and dinners which aren’t guests. Firstly, you’ll be able to enjoy the impressive views as per breakfast if you secure a window or balcony table. Secondly, the friendly staff and affordable menu offer the perfect opportunity to sample some of the local dishes. I opted for the mixed platter of Cuenca cuisine, which showcased some of the best-known dishes in the Castilla-La Mancha region. These included Ajo arriero, which is a cod, potato and garlic mix, Morteruelo, a rich and warm game pate, and my favourite, the tomato, pepper and courgette roasted goodness of Pisto Manchego. 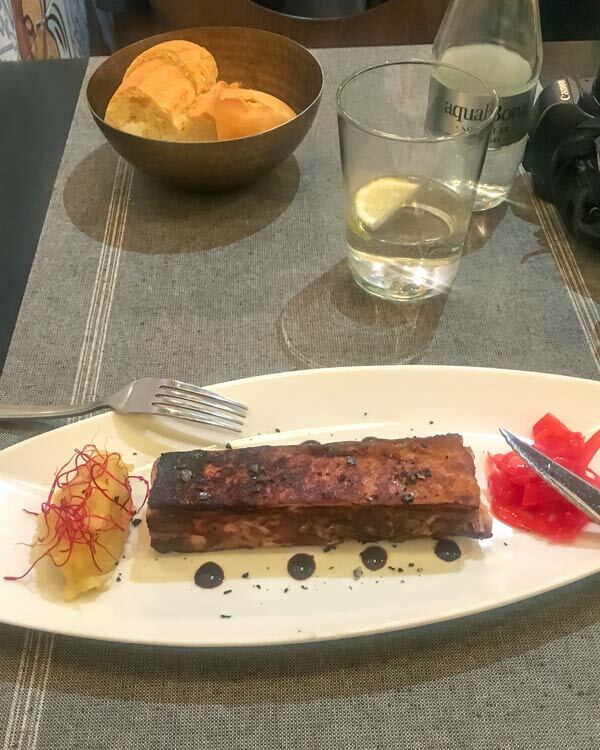 My second dinner was another of Spain’s specialities, Pork, and I enjoyed this in Restaurante El Secreto, which has two venues in the old city. While the food was delicious, the service was indifferent, though I think this was due to being a solo dinner with limited Spanish from viewing other tables in the room. This is a part of Spain where English isn’t so common, which I love, but with just basic Spanish to get by with, I did find myself using google translate, especially when trying to book tours, to fully understand what was on offer. My second day in Cuenca didn’t exactly go to plan. I was meant to join a tour to the nearby Ciudad Encantada, a park consisting of various karst limestone mountains. Being winter, and with the rain rolling in, this didn’t go ahead. You can find more details on the Ciudad Encantada on another of my posts, which lists all the things to do in Cuenca. That said, I ended up having a fantastic day and here is what I got up to. 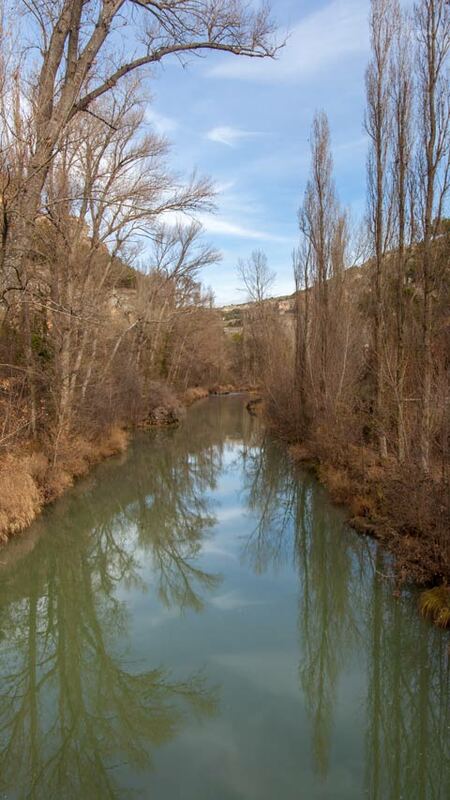 With sunrise already seen across the gorge, I descended to the other side of the city and the Júcar river. Here there are multiple hiking trails of varying difficulties which provide ample opportunities to marvel at the glowing green river. It wasn’t until I was hiking along here that I really appreciated the scale and impressive architecture of the city. From down alongside the Júcar river, you can’t help but look upwards and marvel at the city built onto the sheer rock face. 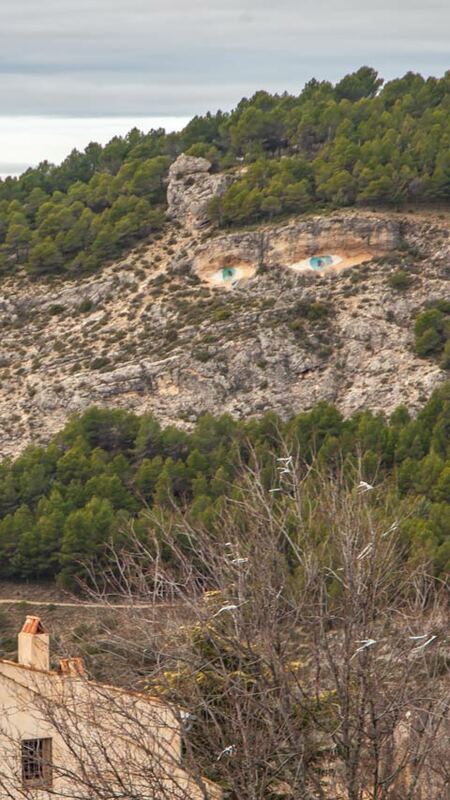 People were rock climbing, and abseiling on the rock faces either side, and faces is quite literal thanks to the eyes which have been painted towards the top. 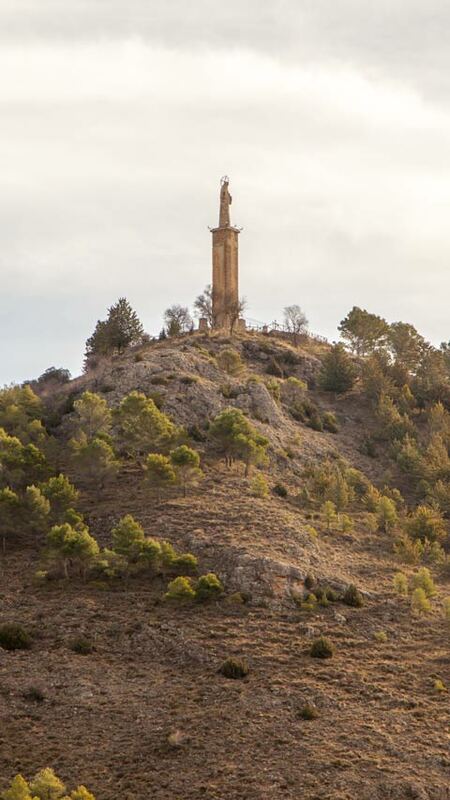 On the other side of the city, there is another hike which will take you to the Jesus statue looking down on Cuenca, and provides some incredible views of the city, given you two different options when strapping on those walking boots. Returning to Cuenca, I slipped into one of the many museums in the city, this time one dedicated to Spain’s celebration of Easter. Having been lucky enough to be in Seville this year for Semana Santa, I was quite intrigued to learn more about this celebration oh holy week in Spain and the small museum filled in my knowledge. 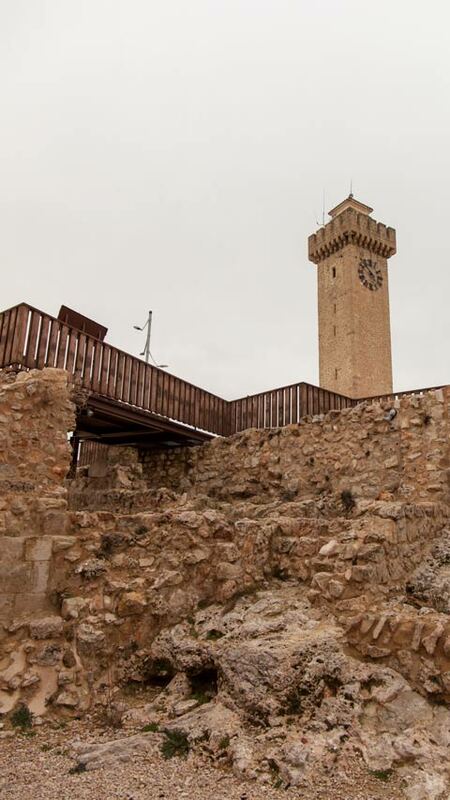 Close by the Museum is the Mangana Tower, one of Cuenca’s many monuments and marking the spot of the old Arabian fortress. It is one of the cities most notable monuments. It lies on the site of an ancient Arabian fortress. Built in the 16th century, the tower is in excellent condition, and you can explore the small ruins of the fort which also has a few houses in a similar style to the hanging houses nearby, although without the cliff faces. The colourful houses, town hall, and Cuenca Cathedral dominate Plaza Mayor, which is a central hub in the old part of the city. While traversing Europe, you can get a little bored of Cathedrals and Churches, and while I was tempted to sit this one out, I’m so glad I coughed up the modest entrance and conservation fee. 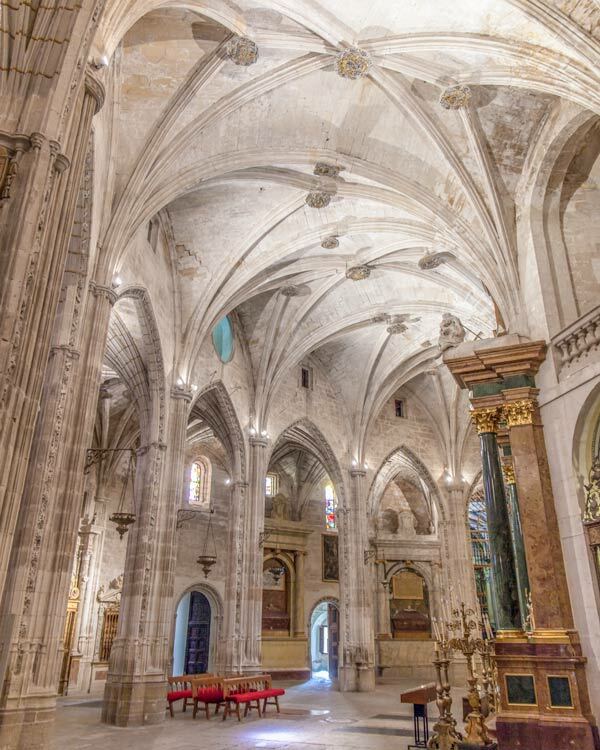 The Cuenca Cathedral is grand and was one of the earliest examples of that built in the Gothic style in Spain. 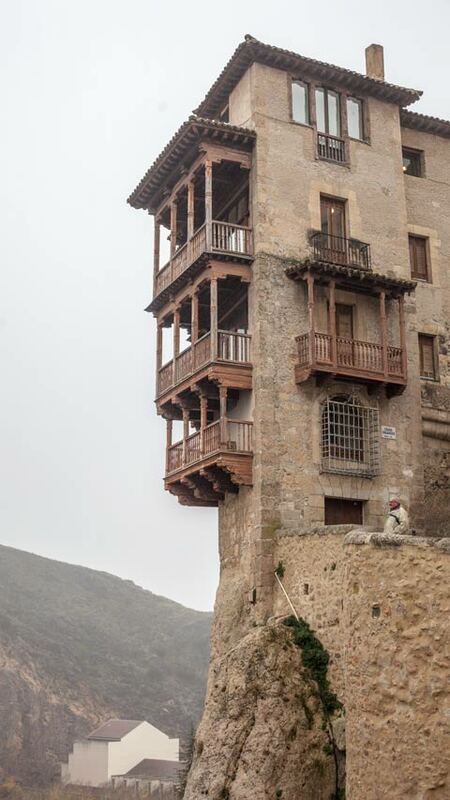 Constructed in the 12th-century, it sits on the same spot a Mosque had hundreds of years before. 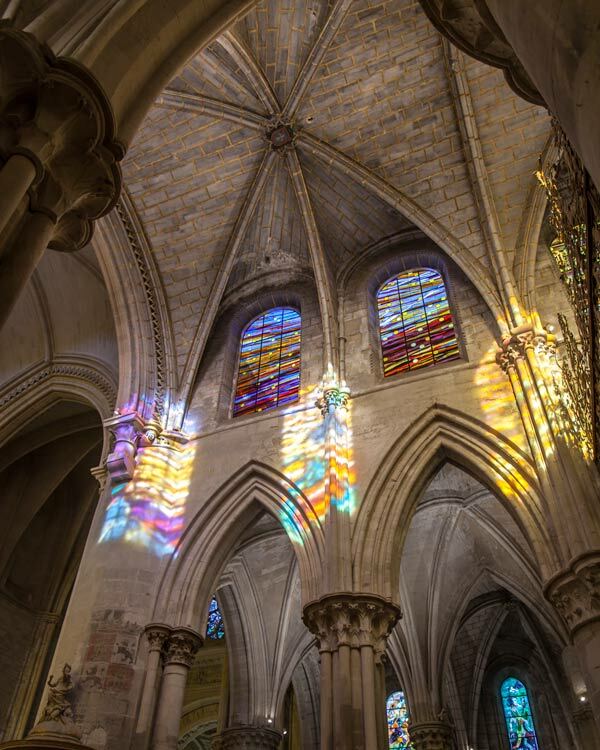 Inside, you will find the imposing towers of the main hall, basking in the colourful light of the stain glass windows. Leading off from the main hall and many smaller rooms, each with their own style and unique decoration. The building work, both inside and out, has been ongoing since the day the Cathedral opened, which is why there is such a range of styles ranging from neo-Gothic to Baroque. This is evident from the outside, but even more so in the smaller rooms. In the courtyard outside, and from the terrace of the Cathedral, you’ll find some equally impressive panorama views. For those who are interested, there are also special nighttime tours of the Cathedral where I imagine the illuminations to add another dimension. As my weekend visit to Cuenca was coming to an end, I decided to walk back to the new part of the city rather than taking the bus. 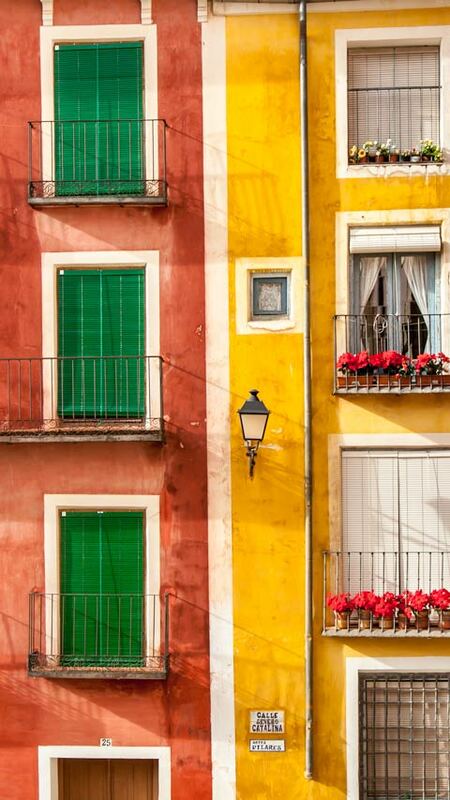 The brightly coloured Alfonso VIII street winds down the mountain and the various shades of houses make for a fantastic photo opportunity. This street also has a hidden set of passages, called the Alfonso Tunnels and while they were closed during my visit, more details of these can be found on my things to do in Cuenca post. Having completely fallen in love with Cuenca, reemerging to the modern world was a sad shock to the system, and just an hour later I was transported back to Madrid. 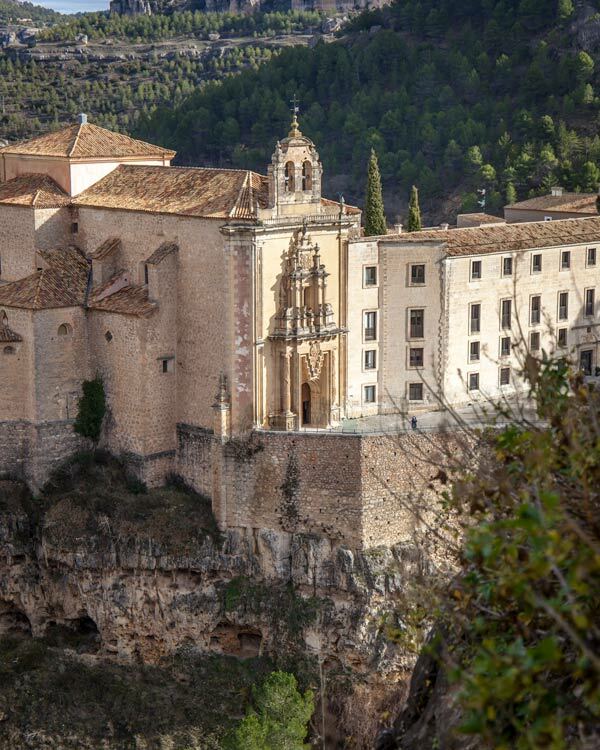 Cuenca is the perfect sized city break and combining the old-world charm of the cobbled streets with the beautiful nature surrounding the city ticked all the boxes for me. 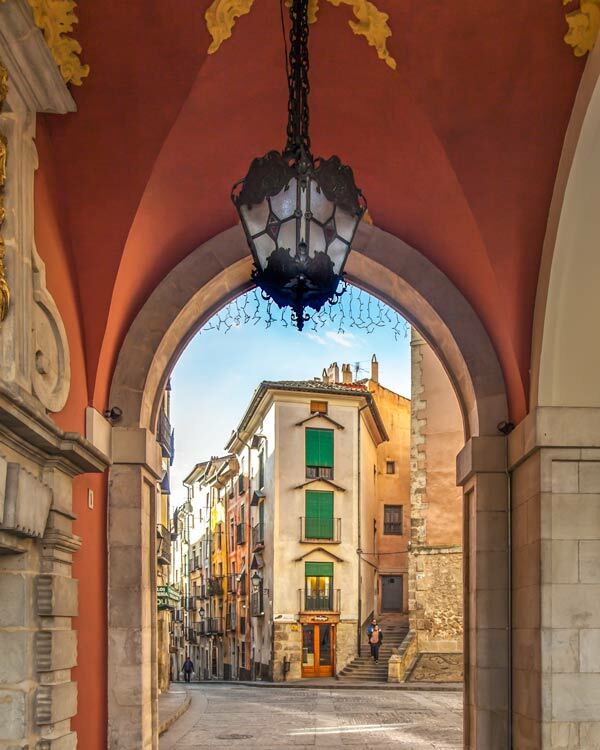 Enjoy discovering this hidden gem of Spain! I fell in love with your photography skills. Mad skills! 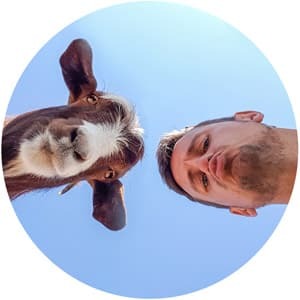 Your articles make me dream … I guess I’m there with you. And this for me is the best for a traveler.